Legoland. Everything really is awesome. When you have children aged five and seven, and you get an email titled “Claim your free tickets to Legoland”, the only possible answer is “Yes, please, where do I click?”. Those without small children may never heard of the lure of Legoland. It is a theme park near Windsor, touting more than 55 attractions specifically designed for children aged two to 12. My two have been clamouring to go to Legoland pretty much since they could bash each other with a Duplo brick, and had been told of the delights by other children at nursery (splitters). e) did I mention the expensive bit? But now, with a taller son and the prospect of some free tickets, we were finally ready for a full-on trip to Legoland. Of course Legoland offers many opportunities to haemorrhage money aside from the tickets, with the chance to buy food, drink, ice cream, photos from various rides, driving licences, entry to extra attractions and assorted side shows plus the ever-present gift shops. Here’s what we discovered about how to visit Legoland on a budget, and survive the world of everything is awesome*, without breaking the bank. *Lego Movie reference. Further evidence that my children have been brainwashing me in all things Lego. As someone who’d never been to Legoland, I found several websites really helpful in preparing for our trip: the Mumsnet Survival Guide to Legoland, tips from the Unofficial Guide to Legoland, and the Mumsnet Legoland 2015 hints and trips thread, with the all-knowing HRHQueenMe. We did also talk to real people and ask their advice about Legoland too. 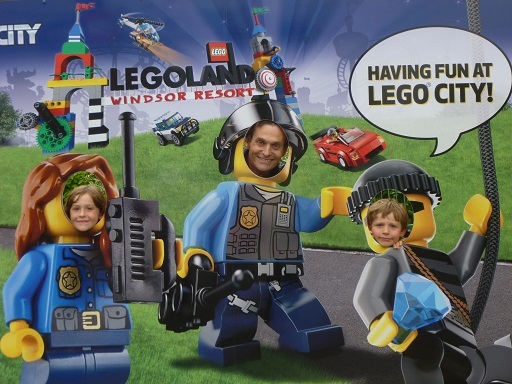 Rock up on the day, and Legoland tickets will cost you an eye-watering £183.60 for a family of four. Book tickets in advance online at the Legoland website. For example, get 10% off when booking 2 to 6 days in advance, 25% off a week or more in advance, or even currently 30% off for families booking a couple of days ahead for dates in June. Check for money off vouchers. Kelloggs has done “buy one child ticket, get one free adult ticket” promotions for several years now. These run right across Merlin Entertainments venues, not just Legoland but also the Sea Life centres, Madame Tussauds, the London Eye, Warwick Castle and other theme parks like Alton Towers, Thorpe Park and Chessington World of Adventures. I don’t normally buy branded cereal, but paying £2 to £3 a packet to save £36 to £48 for an adult ticket definitely seems worth it to me. I cut out a voucher from a packet of Fruit & Fibre months ago (probably due to pestering by a small child) which was due to expire at the end of June, but they’re running a new promotion through to June 2016. I’m pretty sure we got a free adult ticket for Sea Life Hunstanton one year by forking out £1 or so for a pack of orange Club biscuits, so keep an eye on packaging when you’re in the supermarket. The only drawback is these vouchers can’t be used to book tickets online, but only by queuing up at the ticket office on the day. It’s always worth checking whether you actually save money using a voucher plus a full price ticket, compared to buying cheaper tickets online in advance. Use supermarket loyalty points. Tesco Clubcard vouchers can be swapped for Legoland tickets, currently the equivalent of £13 per day ticket, so £52 for a family of four. Unfortunately, I only have £3 of Clubcard vouchers, which doesn’t get me very far. Nectar points are a bit hopeless on the Legoland front, although you can exchange gazillions to get a Merlin annual pass if you have a serious theme park habit. Hand your money to Rupert Murdoch. If you can face subscribing to the Sun, looks like you could get a couple of adult tickets to Legoland for a £1 trial subscription, or a ticket for a family of four in exchange for a £9.99 subscription. Bear in mind that availability may be limited to school days by now. Do check the small print as well: you only get the tickets after you’ve been a member for a month, probably still need to be a member when you go to Legoland, and will need to cancel the subscription afterwards before the rates hike up. Personally, my email offering two free tickets came courtesy of a promotion for Times and Sunday Times subscribers. For work reasons I pay £6.67 a month so I can search the Times and Sunday Times websites, and it includes print copies of the Sunday Times, which would otherwise cost £10 a month. Buy a hotel package. There are some fantastic deals if you fancy a two day trip to Legoland, combining tickets with a hotel stay. We live close enough to consider a (lengthy) day trip though, rather than taking on the extra cost of a hotel. In the end, we decided to do a day trip, armed with two free tickets from the Sunday Times, and one “adult goes free” voucher from Fruit & Fibre. This meant our family of four only had to pay for a single child ticket at the gate, for £43.80. Legoland isn’t the kind of outing we’d do every week, but tickets for £10.95 a head were a bargain. Legoland sting you for parking charges if you drive there. The only budget advice I can offer is that it’s not worth paying £8 for premium parking when the £5 version is just fine, with only a short walk to the entrance. From what I read, the top of car park C is the shortest walk to the entrance. We were directed to car park B. That was fine too. However, in practical terms it’s worth paying online for parking (scroll down this page for parking options) before you leave, so you can print out your parking voucher and don’t have to faff around with queues and ticket machines at the end of a long day. Food at pretty much any theme park or tourist attraction normally requires a second mortgage. Legoland is no exception – £2.95 for a soft drink anyone? 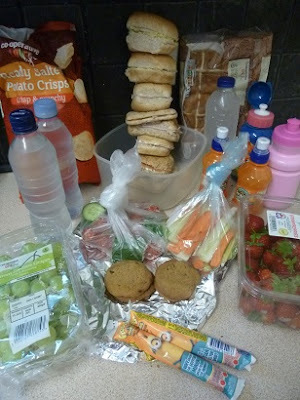 So to survive Legoland on a budget, we took not just sandwiches for lunch but plentiful snacks to survive a long day, drinks and extra drinks, and some supplies to leave in the car for the return trip. For more inspiration on thrifty packed lunches, check out this post. That way I didn’t mind so much shelling out £10.75 for four ice creams. Q-bots are devices to cut your queuing time for various rides, which sound great until you realise that prices start at £15 a head and go up to £75 per person. Ouch. Even so, we considered getting the basic Q-bot rather than spend a whole day queuing, but in the end the park didn’t feel too busy and we were able to get on plenty of the rides without a Q-bot. We did look jealously at all the priority entrances for Qbot holders throughout the park. If we were mad enough to go again on a sunny weekend in the summer holidays, the basic Q-bots would make a massive difference. In addition to the general baggage when leaving the house with small children (hats, wipes, water bottles, suncream, sanity etc) we also took raincoats to cope with the wet rides, spare clothes for all of us in case the raincoats didn’t work and swimming costumes and towels for Drench Towers/Safari Splash. We lugged the iPad round all day in case it might help when queuing, but didn’t use it in the end. With a long drive home at the end of the day, I put pyjamas in the car boot so the children could get changed in the car park before leaving. Legoland officially opens at 10am, but if you get there around 9 / 9.30ish you can buy any tickets needed, get hold of the leaflets with a map, and get into the “Beginning” part with loos. Map of Legoland. Prepare to spend much time staring at it. We only made it just before 10am, but it was definitely worth the early start. If you charge down the hill first thing, the attractions at the far side of the Legoland are likely to have shorter queues than they will later in the day, once other people filter down from the entrance. Finally, the queues will shorten for the big attractions in the last hour or two before closing time, so if your children aren’t flagging it’s worth sticking around to the bitter end. The main advice I saw was that the left hand side of the park is great for younger children, with gentler activities, while the right hand side has more of the thrill rides for older children. Top tip is to decide on the few things you really, really want to do, and if those are likely to involve queues, do them as early in the day as possible. I think we were incredibly lucky to face limited queues, on a grey Saturday outside school holidays and peak season. 1) Atlantis, the mini submarine stylee ride through an aquarium complete with small sharks, rays and clown fish. Brilliant ride, pretty much walked on. 2) Lego City Driving School (6 to 12 year olds) and L-Drivers (3 to 5 year olds). Lengthy wait but both children loved driving their cars around. Managed to avoid paying £10 for a photocard driving licence. 3) Olivia’s House in the newly opened Heartlake City. Nipped in on the way across Legoland, not terribly exciting, some bits of Lego to play with and a shop to remove the children from. 4) Pirate Falls: Treasure Quest. The first of our wet rides, and the reason for crossing the park. Got there about 11.30am, but survived the queue thanks to the pirate ship to play on next to it. Broke into the sandwiches and crisps while queuing and inserting everyone into macs. Everyone really enjoyed the anticipation of being winched upwards before plunging down with an enormous splash. Think my son was a bit bemused to get covered in water. 5) Castaway Camp. This is a playground in Pirate Shores, where the children could climb things and run around madly without queuing. Gave us the chance to eat a bit more of the picnic. 6) Spinning Spiders. Fairground ride where the whole family can sit in a circular booth and spin round madly. The queue for this one moves fast, with 18 booths to fill each time. 7) Pirates of Skeleton Bay Show. We fitted in spinning spiders en route to see the stunt show at 1.15pm, arriving just in time to squeeze into seats. The show was full of cartoon / pantomime type knock about action, but the acrobatics, jet ski and diving off the tall tower were great fun and the children loved joining in with the booing and cheering. 8) Miniland. Wander around worldwide tourist destinations in miniature, through the medium of Lego. I loved St Pauls, the children were fascinated by the space station and the rocket. My husband loved it all, especially the comedy value of an Italian hill town in Lego. 9) Splash Safari and Drench Towers. My daughter’s idea of happiness is large quantities of water, whether swimming pools, puddles, paddling pools or even pouring from gutters. There was no way we were going to escape Legoland without the children changing into swimming gear and trying out the water slides, fountains, shutes and weird plastic animals shooting out water. The only drawback was the grey weather and cold water: my son declared he was “frozzled” early on, and even my daughter was forced to admit defeat before hypothermia set in. 10) Brickville. Another playground, this time in Duploland, and my son’s choice for more running around madly. 11) Imagination Factory. It seemed rude to come to Legoland and not make anything out of Lego, so we headed to the Imagination Centre for some peaceful Lego building. The children opted for the room where you could build anything you wanted from lots of bricks, rather than the room that gave you special trays and instructions to build one of a limited range of specific models. We had thought of going to see a 4D film at the Imagination Theatre nearby, but we showed up for the 3.30pm showing a minute late, just after the doors had shut. 12) Vikings’ River Splash. After a relatively short queue, we squeezed into one of the circular boats with another family, and a father desperate to ride again even though his children refused to accompany him. We got sprayed by various Lego Vikings, whirled around, bashed a bit and splashed. Then it finished. Huh. 13) The Dragon. Finally we were all ready to brave the queue for the big Legoland rollercoaster, spurning the smaller versions of Knights’ Quest and Dragon’s Apprentice. Points for effort at making people queue through a castle though. There are many longer, fancier and more death-defying rollercoasters elsewhere in the world, but the children both thought it was awesome and we all screamed madly. 14) Laser Riders. Gracious the queue for Laser Riders was painful, even though we could see from the barriers that sometimes it’s way longer. Even the black and white short films of Mr Tumble pretending to be an archaeologist and the lego reliefs of pharaohs playing snooker and basketball didn’t help. Think I enjoyed sitting on a small train shooting laser targets the most of all of us (sign of a misspent youth armed with an air rifle). 15) Scarab Bouncers. By now it was after 5.30pm, and we decided to fit in one last ride on leaving the Laser Riders. I went on with the children, was bounced up and down, and think I left my stomach somewhere up near the ceiling. 17) Lego Star Wars Miniland Model Display. Dedicated to all things Star Wars, although as my husband witheringly said: “It’s all about the wrong films”. We got there at 5.55pm, five minutes before official closing time in June, but did get to walk through the Star Wars galleries. Surprise, surprise the shop was willing to stay open long enough to let us buy a small Lego Star Wars kit for both children before we headed for the car park. We finally left with two pyjama clad children in the back at about 6.35pm, obediently turning right at the Legoland roundabout for the M25, rather than getting snarled up in Windsor traffic. My son fell asleep in the car clutching plastic bags of Lego that he didn’t want to open and lose before getting home. My daughter declared it the “best day ever”. All in all, Legoland was a much more efficient and enjoyable experience than I’d expected, extremely well done and very polished. It genuinely was a fun day out for all the family. And if you are planning a trip, I hope this post has been helpful in visiting Legoland on a budget! Disclaimer: nope, no-one paid me to write this post either, we just had a fabulous day, partly because we benefited from bloggers who had gone before us and passed on their top tips. Only sorry this post ended up much longer than I’d expected! If you do have a bigger budget and want to stay longer at Legoland, check out the fab short breaks and offers from Legoland Holidays. Just don’t tell my kids or they might sell one of my kidneys. I'm just glad my boys are all grown up and I don't have to go (that sounded very scrooge-like … hehe). Legoland sounds fab but not cheap. Seems loads to do though! Thanks for linking up to #MondayMoney. Hope to see you again next week.